I always knew Sandong Kalguksu makes the best knife-cut noodles I’ve ever tasted, but I didn’t know they also made one of the best versions of konguksu. 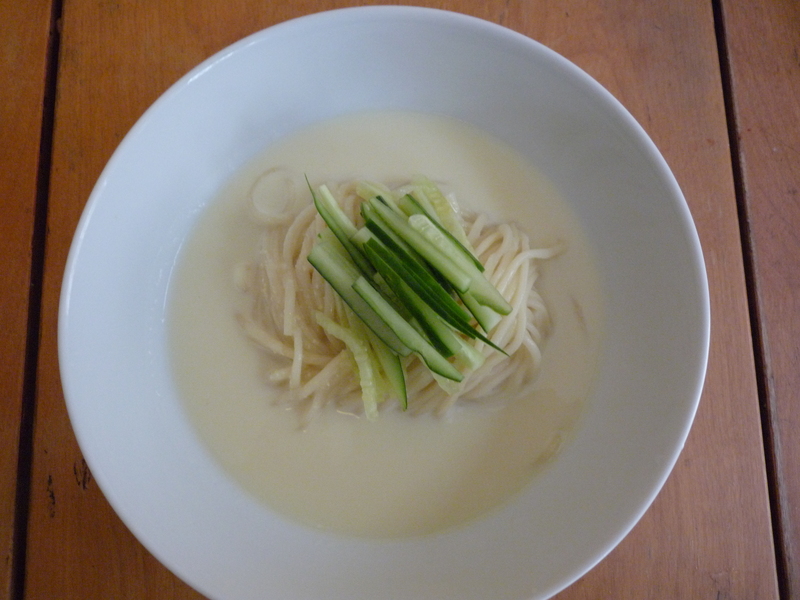 Konguksu is a very popular summer noodle dish in Korea, where plain wheat noodles are served in a large bowl of ice-cold fresh soymilk, usually garnished with a few strips of cucumbers. Normally, it’s served with a little dish of salt for you to flavor to taste. You wouldn’t think it would taste like much. It’s a completely vegetarian, even vegan, meal, but it’s filling and sustaining, and much more enjoyable source of protein than a big piece of fatty meat on a hot summer day. I wouldn’t have been surprised if the noodles in this konguksu were superb — they were — but what really surprised me was the broth. Most konguksu broths are thin. When I make soymilk for this dish, I push soybeans that have been briefly cooked and then pureed through a strainer. I don’t know how Sandong makes theirs, but they end up with an insanely thick puree of beans that enrobes each bite of noodle. It’s still a soup, but more the consistency of a thick pureed soup than a thin stock. I took this photo awhile ago, but I don’t post every photo of food I take. 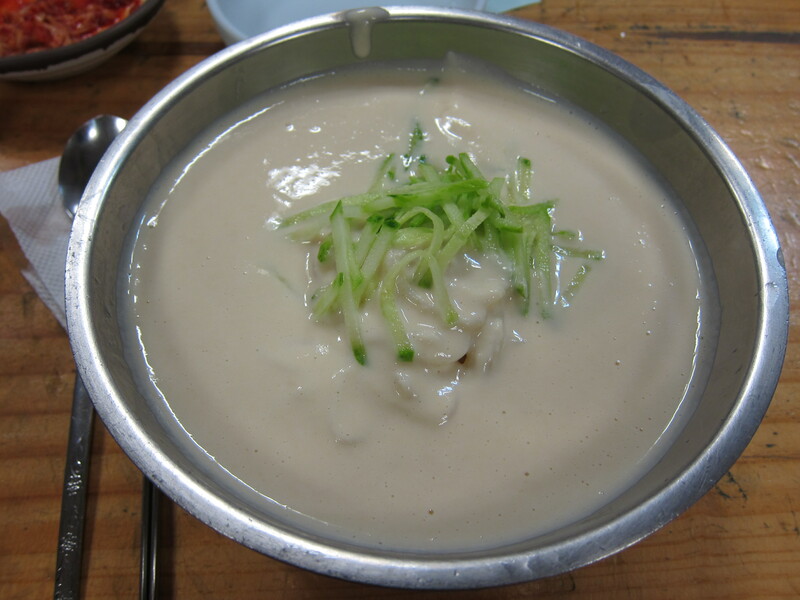 It’s kongguksu, a summery dish of wheat-flour noodles in a cold soybean soup that gets liberally salted. The whiteness of it bothered me when I was a kid, but now, I think it’s delicious.